The first time I read Lewis Carroll’s Alice’s Adventures in Wonderland, I was a graduate student with a caseload of 125 freshman. I taught three different ability levels of ninth grade English, from general ed to honors. My professor had assigned Carroll as an example of Victorian children’s literature. As I worked my way through my first year teaching the gifted kids, Wonderland came to represent much more than a literary period. Teaching the gifted kids was supposed to be easy, and it was – at least, at first. As the years passed, though, I began to notice something: my brightest thinkers weren’t the stereotypical overachievers who aced every assignment and breezed through every test. No, the truly gifted minds were the ones who spent the majority of class staring out the window, lost in the depths of their own thoughts. Their binders were always a mess; their homework was always late. Most of them barely scraped out a C, and not because they couldn’t hack it. It was because I couldn’t reach them. The gifted label is kind of a misnomer. It’s not so much a gift as it is wiring – the neurological construct of a person’s brain, primed for the reception, processing, and evaluation of information at a highly efficient rate. In gifted children, the brain tends to devote an enormous amount of attention toward the development of these skills, leaving other aspects of development to the side. If I was going to engage these busy, brilliant minds, I would have to turn educational norms on their heads. I had to start teaching in Wonderland. The truth of this epiphany hit home a decade later, when I dropped my oldest off for her first day of kindergarten. That first year was every bit as dark and foreboding as the thick, twisting forests of Alice’s nightmares. There was too much structure, not enough challenge, and a heavy dose of sensory input that sent her over the edge. My daughter went into kindergarten reading books like The Hobbit on her own. She came out of kindergarten with a giant F, an erroneous “diagnosis,” and a crippling case of anxiety. The truth is, my gifted child needed to be homeschooled. We brought her home for first grade, created our own Wonderland, and haven’t looked back since. You don’t know the meaning of depth until you’ve met a gifted child. Interests aren’t just interests. They are obsessions, pursued with an unmatched fervor. It’s easy to get irritated at first, especially when that singular devotion gets in the way of your homeschool plans. But if you embrace the idea of delight-directed learning and roll with it, you’ll find they do a lot of discovery on their own. Take my oldest, for example. When she was five, G read every dinosaur book she could find, regardless of reading level or genre. One day, G stumbled across a tiny factoid: in the 4th century BC, a Chinese historian named Chang Qu identified a dinosaur fossil as the remains of a dragon. G realized that despite its status as a mythical creature, the dragon had its roots in science and history – her two most favorite subjects. From that point forward, it was all dragons, all the time. I could have fought the obsession, and for a time I did. But one day I realized: why not let her pursue the favored topic to its furthest ends? Her current studies had hit a number of my academic objectives anyway, from geography and environmental science to anthropology, sociology, and comparative biology. Fighting the tide was pointless. She was motivated, engaged, and learning on her own. Respecting your child’s singular focus isn’t the only key to homeschooling your gifted child. 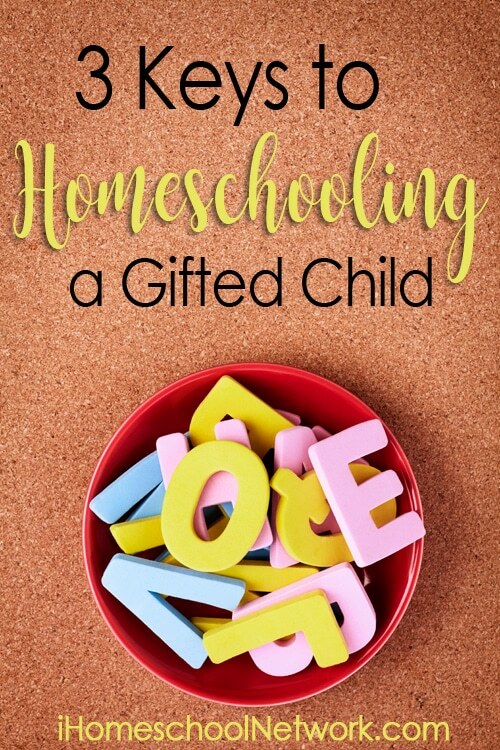 You’ll also find an awareness of your gifted child’s sensitivities a boon to your homeschool relationship. If you’re unfamiliar with OE’s, they are a set of traits specific to gifted children, characterized by their overwhelming intensity. They include psychomotor, sensual, intellectual, imaginational, and emotional excitabilities, each with its own strengths and challenges. There are five OE’s, each with its own strengths and challenges. The key to homeschooling your gifted child is to help her capitalize on her strengths and cope with her challenges. My six year old, B, is a perfect example of this, as she carries a number of OE traits. Homeschooling her is a challenge for sure, and more than once I’ve considered putting her in school. But she thrives on the days when I remember to honor her sensitivities, and we both benefit from the effort. Gifted children’s brains are a wonder. They don’t develop at a consistent rate, and some aspects of their development are slower than others. For my family, this manifests socially and academically. Our oldest can conquer high school level reading and writing material, but conversations with friends are a challenge. Her sister holds intellectual conversations with adults and maintains a variety of strong friendships, but still hasn’t learned how to read. Neither one of these issues makes my daughters any less. They may exhibit impressive skills, but they are still children who develop at their own pace. Our homeschool day goes much more smoothly when I remember to let them be little. As a former gifted educator turned mom to gifted kids, I’m grateful that I’ve gained some perspective. True education is all about exploration, and I’m glad they’re taking me along for the ride. Ginny Kochis is a Catholic wife, homeschooling mom, and teaching writer from Northern Virginia. She writes about faith, homeschooling, and gifted/special needs parenting at Not So Formulaic.